This portal serves as a reference and starting point access to all page with technical contents relating to the fountain pens world. Because the fountain pen history is inextricably linked to its technical development, there will also be references to the technology historical aspects, for which, however, we refer to the History portal. They are also in part reference to pages relating repair and restoration of fountain pens, for which has been however prepared a dedicated Repair portal. For a general overview of all the articles related to this portal classified in its Category. The distinguishing characteristic of a fountain pen is to be a tool combining a nib with an ink reservoir in a single writing instrument thus allowing long writing sessions without being continually interrupted by the need to re-dip the nib in the ink. 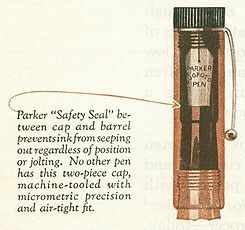 The correct functioning of a fountain pen is linked to a harmonious and complex balance of forces whose correct interaction is able to ensure that the ink flows uniform and controlled manner from the pen tank to the paper with only that slight pressure that is obtained by placing the nib on the sheet. The fountain pen history cannot be separated from an analysis of the main materials that were used in their construction over the more than 100 years of life of this object. The materials in fact were an element of innovation and distinction, both technically and stylistically, and also today manufacturers seek to market their models enhancing the preciousness (real or perceived) of the materials used to build them. 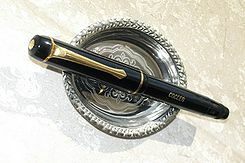 The creation of new filling systems has always been, especially in the golden age of the development of the fountain pen, one of the major factors of technical innovation, and for this reason also the birth of new companies; In this field the most famous examples are the Conklin, born for the invention of the Crescent filler and the Sheaffer, which entered the market with the creation of the lever filler, but many other less known companies (such as the Onoto, the Dunn, the Moore or the Chilton) have had a similar origin. When having to deal with vintage fountain pens is often a common event having to deal with malfunctions or damages suffered by an object whose age could easily exceed yours. From this page have been collected a series of articles, references and resources that we believe may be useful for those who want to make the repairs, (materials, equipment, reports, notes, references to professionals). This page was last edited on 17 December 2018, at 22:51.